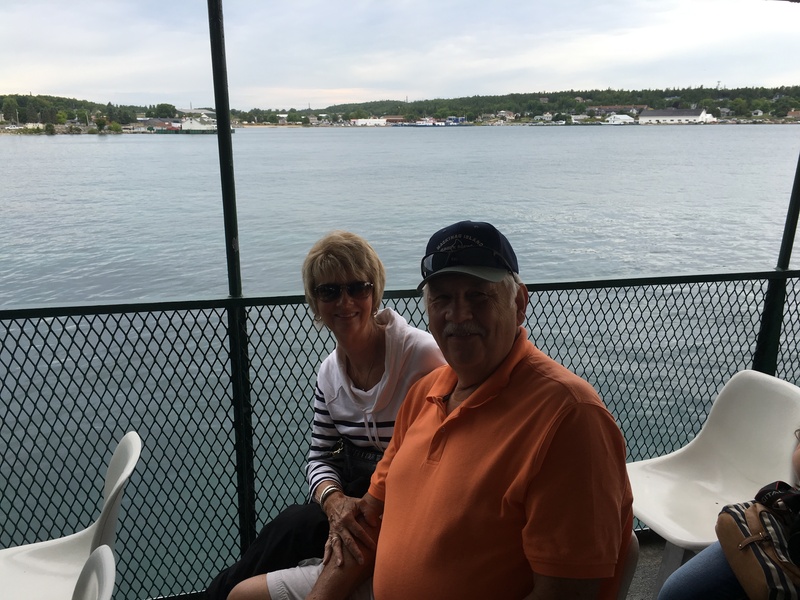 Another Day on Mackinac Island – Let's Go RVing! We woke up to a sunny day with blue sky and not a cloud in sight so we decided that perhaps the weathermen didn’t know what they were talking about (they did). In that vein we decided to go back over to Mackinac Island. 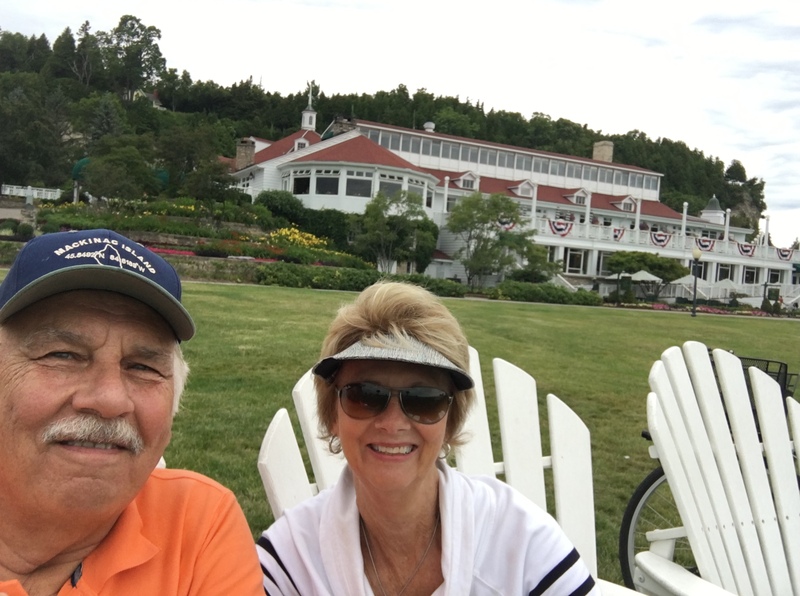 We really didn’t get to see the Grand Hotel nor the fort when we were there earlier in the week plus we so enjoyed riding the loop around the island that we wanted to do it again. We decided to take Arnold’s Ferry today since it had been recommended and it was $18 cheaper. Jerry got the bikes on the back of the car and we drove to Arnold’s not very far down the street. Our ride over was nice, perhaps a little longer but it was fine. The water was calmer today so we sat up top and enjoyed the fresh air and breeze. As soon as we got off the ferry and got our bikes Jerry got a map from the Visitor’s Center and we set out for the Grand Hotel. At one point we had a very steep incline and I just couldn’t make it up. I couldn’t get off the bike with the basket on the back and Jerry was long gone so I just straddled the bike and walked it up the hill. Sometimes it really is nice when you don’t know anyone around you! I got back on at the top and rode on up to the hotel. Jerry was waiting and we quickly put out bikes on the bike stands. The flowers at the hotel are spectacular, colorful and plentiful. They charged $10 to walk through the hotel – guess that’s to keep the riff raff out and it worked – we didn’t go in! We’re really not very good at selfies! We then got on the bike trail from that end and rode the 8.2 mile loop again. It was so much more fun! I saw a lot of things that I didn’t get to see the previous time due to the rain and wind. When we got to the Mission Point Hotel I suggested we go out and sit in the large Adirondack chairs. As we were sitting there fiddling with the selfie stick we felt the first drops of rain so we headed on into the main part of town. We had planned to visit the fort but decided to go on out for lunch first since it was raining was coming down pretty steadily. I had been told that the mussels at Yankee Rebel Tavern (boy, that’s a politically correct name for visitors) were delicious so we decided to eat there only to discover that mussels are only served in the evening. As we ate we watch the rain continue to pour so we decided to order dessert, something we rarely do except when we’re traveling. We got the crème brulee and it was pretty good – we scraped the dish! The rain had let us a bit so we walked around a few stores. I bought a cap and then we realized it was 2:40 and the ferry only left at 3:00, 5:00, 7:00 and 9:00. We didn’t want to wait until 5:00 so we hustled out, got our bikes and were immediately at the loading dock. By this time it was really raining hard. When we got back to St. Ignace Jerry had to put the bikes back on the car rack in the deluge of rain. I think he did it in record time! As soon as we got back I walked over to the office for a bit to see if I could get some Internet connectivity. After chatting with a couple tenting for two weeks (really) I went back to the coach, got a cup of coffee and promptly took a nap. Jerry kept asking me if I wanted to continue to sleep and I did. I got up and ate just a little bit and then went right to bed. I was tired!